2P START! Live! 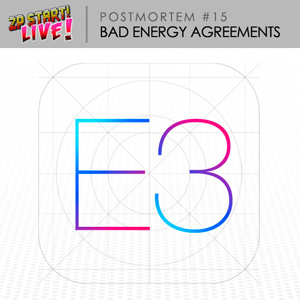 : Bad Energy Agreements | 2P START! By popular demand, Ray and Tim reunite after a year of silence to scrutinize E3, but end up diving into the deeper issues of industries void of creative thought, the unwillingness to admit failures, the destruction of originality, and… girls at weddings with bad energy. I honestly can’t wait to listen to this tomorrow. It’s been so long since the last one. Thanks for not forgetting about your fans after all this time, and know that there are still people out there who really appreciate your work. It helped me through some dark times, so I owe you guys my thanks. Awesome, a new Podcast! Definitely looking forward to listening to this tonight. Hope Ray works his magic because we were way rusty. Sorry about that! Well I guess the fact that I still check this website on a somewhat regular basis is a good thing! Oh, and these podcasts USED to be good. Jk, NPG. I really enjoyed the podcast! I look forward to the next one. Maybe a summer movie commentary, so that Tim can complain too? Speaking of which, congrats on the new daughter Tim! Ray, best of luck with the hunt for an effective creative outlet, and if i hear about anything up here in Silicon Valley I’ll be sure to let you know! Really good podcast guys! It was great listening to you again. I was hoping to get to sleep at a good time, but I had to stay up to listen to this. I too really miss creativity and new ideas in video games. I’m getting annoyed at all the shooters and sequels. I do kinda like the nostalgia that Nintendo keeps trying to bring back with everything, but I really just want something really new that I’ve never seen before. Congrats on the new kid Tim. I can’t wait to hear what new idea you guys come up with next! Aw man, that ending made me laugh to tears. I love you too so much. Good Ecclesiastes jokes. Oh man, i’m going to listen to this tomorrow. I’m in the middle of it now. I really missed listening to you guys talk about stuff, but I can’t help but feel disappointed with this one. There’s not really as much funny or witty analysis of things as there is cynicism and complaining. One of the things I loved about, say, the Black Doom Awards of the past were that you always poked fun at the things you didn’t like. Made it funny and enjoyable to listen to, you know? Felt a lot more doom and gloom today, and I guess I’m just not having fun listening. After a year of silence, there finally comes another edition of my favorite podcast, which I eagerly listen to in anticipation of their opinions on the gaming industry, what’s happening in their lives, and what the future may or may not hold…. I’m just kidding. I enjoyed the podcast, and unfortunately agree on the state of the industry right now. When I graduated from high school, my greatest dream was to become a game designer and create genuine new ideas for players to enjoy. After a couple years at college, I gave up on my dream because the field is to competitive and quite frankly, the video game industry is pathetic. I grew up playing Pokemon Blue version, a game that revolutionized Role Playing Games while being kid friendly. The company that brought us Pokemon in 1996 has used the same formula to produce a total of 19 games (not counting spin-offs). After 15 long years Pokemon X and Y for the 3Ds will be the first Pokemon title to abandon 2D sprites during battles. 3D models on handhelds was an exciting concept 10 years ago. It took Nintendo 10 years to update their franchise! Meanwhile, Sony and Microsoft are content with upgrading the graphics of games, while re releasing the same generic multiplier shooting games and people are content to buy them religiously. The point is: I understand your frustration with the gaming industry. Games aren’t made the way they used to. I suppose this happens to every generation, but rather than view the future with judgmental eyes, we ought to keep digging through the haystack to find the needle. For every ten crappy popular games, a work of art slips by the masses attention to end up hanging on the wall at game craze. The next one might be yours. If you think you’ve got what it takes, then go for it. I was starting to think that you guys had moved on, but I knew that Ray couldn’t pass up a chance to talk about a new Smash Bros. Also, Smash Bros is the game that will make me buy a Wii U. Really great to hear from you guys again. To add to my earlier comment, I was thinking about Ray’s experience at the wedding, and wondering how to handle people like that. On the one hand you want to take them by the shoulders and scream, “Where do you GET your philosophy?! Have you ever heard of common sense!? Maybe Logic? !” But of course, that won’t help them (although it might make me feel better). In the end I think Ray did the best thing possible in a situation like that. He handed it off to God. Just my random thoughts. Haha, this entire thing pretty much seemed like a giant Black Doom Award. Thanks for the update guys. Oh wow, I think it’s been years since I’ve left a comment on 2PSTART! Frankly, I’m surprised that I could still access my old account here, haha! It’s so great to hear from you guys again, Tim and Ray! I think of you every so often and wonder how you’re both doing. 2PSTART was a big part of my life for the years that it ran, so you guys are pretty important to me and I worry about you! It’s great to hear from you in a new podcast after so long. Thanks for not forgetting about us! Of every webcomic that has ever existed and ever will exist, I’ll always be loyal to 2PSTART. Oh and by the way Ray, I still have your “Hey Girl Hey” album in my car and I jam out to it on a regular basis. Your music rocks! Gah! I keep forgetting you posted this!! I will listen to it soon! On the Xbox One, I’ve heard they announced it pre-E3 so that they could focus on the games it will have once it comes out, and not have to spend half the convention talking about the features that it will have after a speech and preceding a Q&A session. On nintendo, I heard an interesting idea from from someone I know, that it would be in nintendo’s best interest to move out of the console industry ala sega, but with good games in the future instead a bunch of bad ones. (I would not at all be opposed if it means a potential nintendo promo for TF2.). It would be very interesting for the Smash Bros. Franchise, and would really help towards Tim’s idea from however long ago of just a fighting with everyone from everything (Impossible as it is amazing). On the PS4, it’s honestly the only Next-gen console that looks appealing. The Xbox might have Kinect, but that was never interesting to me in the first place. And while the Wii U might have Smash Bros. 4, but it’s the only game I’ve seen besides Bayonetta 2 I’m interested in that looks better there than on other consoles, while the PS4 has free online, absolutely no sharing DRM if you have the disc (Still think of the comic you guys mad on Spore’s DRM every time I say that), and the next Sly Cooper and Infamous games, on top of steam compatibility (Hopefully). I can’t remember what I was going to comment about this, but npg nonetheless! The nostalgia is crazy, I still think back to RPing on this page and all the fun I had. To think how long ago that was. I mean I have my old myspace page attached to my account, I really miss all the fun times, needless to say, I’m really excited about this podcast. In the mean time, live a good life, and until the next podcast (or post-mortem comic). Tchau! We’d need to use a weedwhacker to find the content. It would be like a safari. I decided to read through your comic archive on February 13th, and pretty much read the whole thing in under 12 hours. Then I checked out the podcast because I knew Matthew Taranto was on an episode, and wanted to hear that. I listened to that one first, and wanted to hear more of Tim and Ray, so then I went back and started from the beginning. Now, almost 2 months later, I’ve finally finished listening through the whole archive and enjoying every second of it. My favorite moment would be a tie between the “Internet Police” Black Doom Award, and the “Tim is racist” attack ad. Both are just awesome. Anyway, hopefully Tim’s perspective on the 3DS has changed by now, because there are a LOT of amazing games on it. Will you guys be back for E3 2014, or maybe sooner? I’d love to hear more of this. so…. gonna be around this year too? I sure hope there’s a podcast in the works. I’d love to hear their opinions on Smash and the new Zelda. Guuuyyyys come on I wanna hear you talk about stuff! I’m with Doopliss; really hungry for another podcast! I’d like to hear your thoughts on where things are now, because it seems like so much has changed in gaming since the years of 2P Start!. I hope the new podcast will be here soon. I want to hear Ray rant about the new smash bros game!